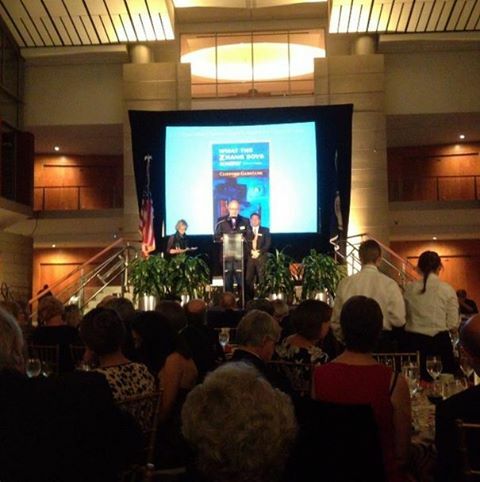 The culmination of this year’s Virginia Literary Festival in Richmond was the presentation of The Library of Virginia Awards. I drove down on Friday afternoon, checked into the Linden Row Inn, and went to a party for presenters at the James River Writers Conference, which was to kick off on Saturday morning. It was fun to see a lot of people I knew there—in a beautiful Richmond home—and to relax a little with some good food and wine. For me, though, the main reason for being there were the awards on Saturday. First thing on the agenda was the awards luncheon. There are about 400 people there in a ballroom of the Greater Richmond Convention Center—most of them participants in the James River Writers Conference, but also members of the public, the award finalists, family and friends. Finalists were all seated at different tables so that conference participants could mingle with them. Just as we began on the dessert (I had a wonderful looking piece of chocolate cake in front of me), the awards presentation began. The Director of the Library of Virginia called the finalists up one by one, presented us with our medals, and had us stand up front until it was all over. First the 3 non-fiction finalists were called, then the poets, then fiction, then the People’s Choice. Then we were all herded out to the hallway where tables were set up for us to sign books that the luncheon participants were encouraged to buy. I was seated next to Kevin Powers, author of the bestselling The Yellow Birds, and he had a steady stream of admirers. That was fun, although I didn’t get to eat my cake! Then the fiction finalists—2 from the juried awards (Kevin and me) and 2 from the people’s choice awards (Gigi Amateau and Lydia Netzer)—participated in a panel discussion in front of an audience of about 50 JRWC attendees. (After the panel, a women told me how much she’d enjoyed my story “Leviathan” that she’d read years ago online. She was happy to hear that the story, renamed “William & Frederick,” appeared in my first book, In an Uncharted Country. Then it was back to the hotel to get ready for the awards dinner, where the actual winners would be announced. Put on my tux. Got my bow tie looking pretty good. And headed over to the Library of Virginia. I got a ride with some folks, so I was early, but given my nervousness that was probably better than the alternative. We were escorted to a private room for the “sponsors’ reception”—and a couple of glasses of wine helped. Then back downstairs for the dinner, set up in the great hall of the library. Images of all the nominated books were projected on the big screen behind the stage. And each table had a picture of a book image—so it was easy to spot where I was supposed to sit. There were 8 of us at the table and we had a pleasant conversation. Then came the awards—just as dessert arrived. I was too nervous by then to eat, anyway, so I just looked at it (a miniature book in chocolate). First they did the juried poetry, then the juried nonfiction, and then it was time for the juried fiction. Lee Smith did the presentation and described my book, Kevin Powers’s book, and Chris Tilghman’s book. We all stood to be recognized. And then she announced the winner: What the Zhang Boys Know by Clifford Garstang. My heart raced. I heard gasps and cheers. And I made my way up to the stage. Lee handed me my trophy and an envelope and I stepped to the microphone. I hadn’t really prepared any remarks—I didn’t know that was part of the deal—but I expressed my thanks to the Library, to my fellow finalists, and also to Kevin Watson and Press 53, and also I said that the award showed that small presses were definitely part of the literary conversation. And then I somehow made it back to my seat. I barely heard the remaining presentations—the people’s choice awards, the special poetry prize (R.T. Smith), the special art and literature prize (Orhan Pamuk), and then the lifetime achievement award (Charles Wright). Then it was all over—except for more pictures, more congratulations, more signing of books. An unbelievable night. I would gladly have continued to celebrate, but I was exhausted and went back to the hotel room. The highlight of my writing life so far, without a doubt. Congrats Cliff! Well done, sir! Congratulations, Cliff! I wish I could have been there to celebrate with all of you, but it’s great to read here about your well-deserved win! Thanks, Belle! I’m honored to be on the list with you!